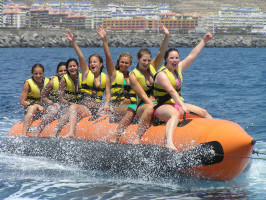 Have a wet and wild time while you’re in Southern Tenerife with our massive range of fun water activities and sports to make the most of your time on the beach. 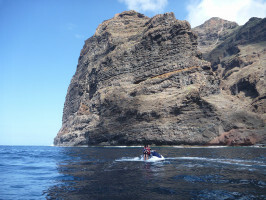 We have jet skis, banana boats, parascending and much, much more. 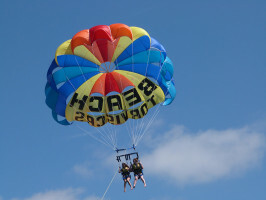 This is water sports as it should be – adrenalin-pumping and exhilarating fun that will get you on a high all day long. Available at the following beaches: El Camisón, Playa el Bobo, Tryoa, Torviscas, Fañabe, Puerto Colon and El Duque. 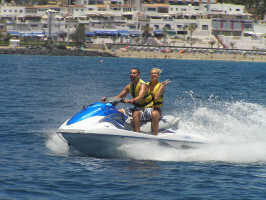 Get behind the handle bars of a 2-person jet-ski and spend 20 minutes making white water patterns in the sea. Before you set off you’ll be given a brief safety tutorial, then you’ll settle into the seat of your jet-propelled craft and see what it can do. Or try parascending, as you soar high into the sky like a seagull and then descend gently into the sea in a strangely serene experience. Suitable for all ages as long as you don’t mind a dunking. 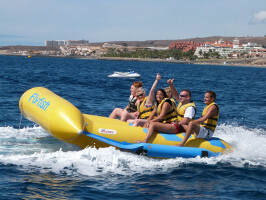 Enjoy the thrills and spills of our ever-popular ride upon our banana boat with capacity for 8 daring passengers. Just see if you can keep dry. Or if you’re looking for something really challenging, why not have challenge the law of gravity in our Fly Fish. Just see if you dare. Capacity for 12 brave souls. We can offer all sorts of packages and combinations, just ask your agent! Spanish, French, Italian, German and English. Child price is the same as the adult price. Children from 16 - 18 years old can use jet skis with parents' permission, accompanied by an adult.